Looking to streamline your business communications in an affordable and technologically advanced way? Then free fax to email is the cost-effective solution that you’re after. FaxFX offers a range of cutting edge products and services that can boost productivity and reduce costs in your enterprise. Free Fax to Email – Easily incorporate your fax correspondence into your email with our affordable free fax to email solutions. Fax Archiving – Our fax archiving services apply the convenience of email to the act of faxing. FaxFX automatically archives all your received and sent faxes in a safe and secure place organised by date and subject. Print to Fax – The cutting edge FX Fax Printer enables you to easily send a fax from any program fitted with print capabilities. Employees can easily send a fax from Word, Excel or Pastel or any other common software application. Features fax preview and ultra high file compression and conversion. 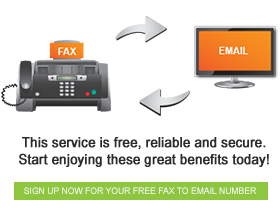 FaxFX’s fax to email services are available completely free of charge. You get to keep your fax number for life, even if your company relocates premises. Let our automatic archiving and storage service make keeping track of your faxed documents as safe and simple as possible. Contact FaxFX to learn more about our free fax to email service and build your business with the latest communication technology available in South Africa.